There is no way you can increase the storage of iPhone and therefore the storage full issue will definitely disturb you in long run. It is therefore advised to make sure that the best ideas are applied to get the work done. There are many processes which can be followed to make sure that the storage issues are completely resolved. To completely resolve the iPhone storage issue the users in most of the cases don’t have to use any third party program. Below are the top 8 solutions which can be applied to make sure that the iPhone storage-related issues are resolved. 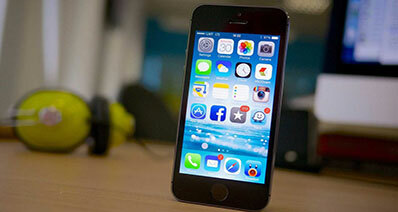 App cache is one of the worse issues which are faced by the iPhone users and therefore it should be resolved. Clearing app cache is very important to resolve iPhone storage issue. To make sure that the best and the most advanced process is followed you need to apply the steps which are mentioned as under. It is to be noted that deleting browser cache and the app cache are two different things and therefore should not be mixed at all. Within the menu click settings and then the app which you want to delete the cache from. 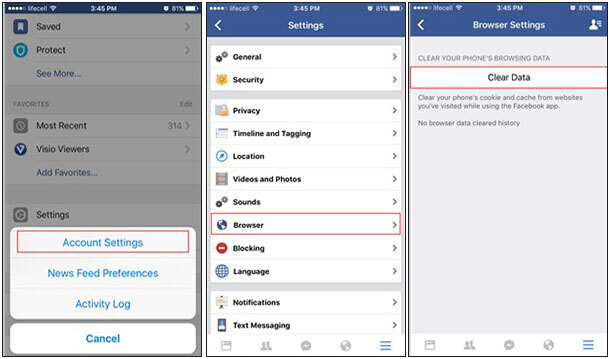 Within the settings of the app, you need to clear the app cache to completely resolve iPhone storage issue. 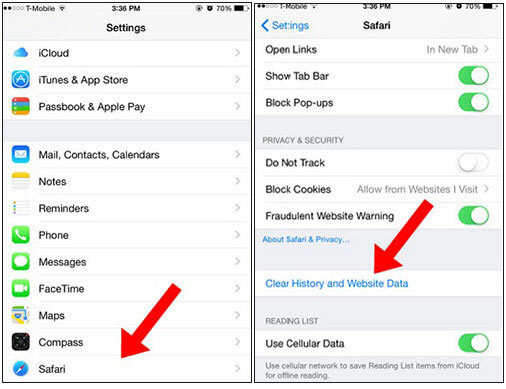 It is also to be noted that only in this case you will see the “Clear History and Website Data” option. For all other apps, there will be app cache option. Once you have completely deleted all the cache data the issue will be resolved. This is another way to make sure that the storage issue on iPhone is resolved. To make sure that the best idea is implemented to resolve iPhone Storage full issue the steps which are mentioned as under should be followed. Head over to the settings of the app you want to clear the cache of. Click the account settings of the application. Choose the related app within the account settings. Clear the data of the application and this completely resolves the issue in full. 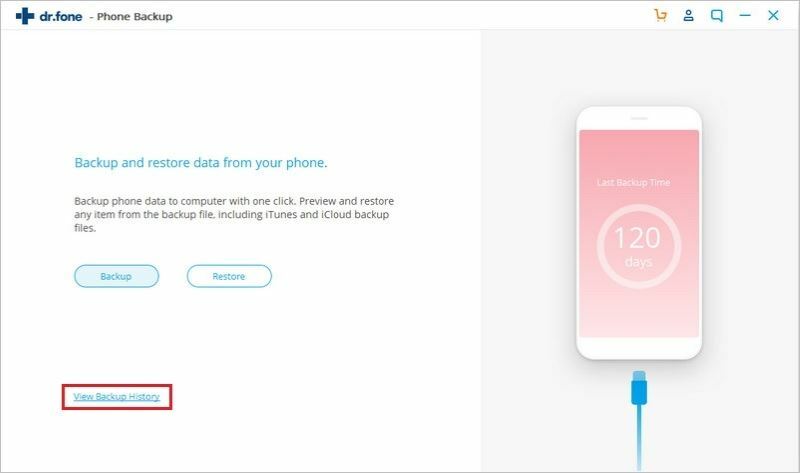 To backup iPhone files to computer and delete them to free up space on iPhone is another method. iSkysoft Toolbox - iOS Data Backup & Restore is one of the best and the most advanced program which can be used to get the work done with ease. The program manages the data of the iPhone in such a manner that the issue of space never arises at all. 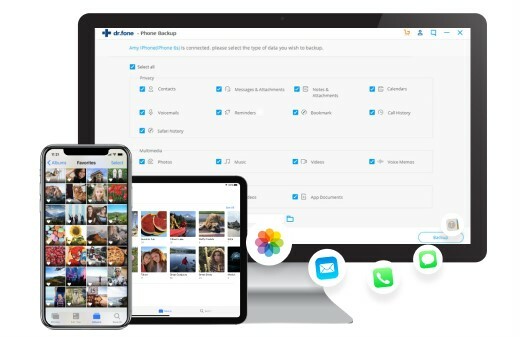 To resolve iPhone Storage problems, the program can be used to backup iPhone photos, videos, contacts, messages, WhatsApp messages, App attachment, etc. You can restore the needed data from the files which have been backup. It means that you can easily save the space on the other devices. Before you restore the file you can easily preview and choose the files as you want. Whatever the file has been stored in your system you can easily make sure that it is saved through this program using a printable format. 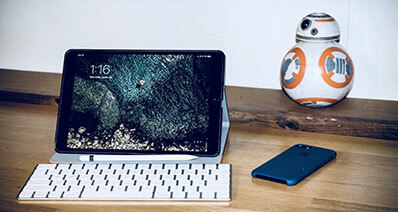 The program supports many iDevices and models. The latest iPhone X has also been added to the compatibility list which means huge device base. You can easily free up the iPhone storage using this program. 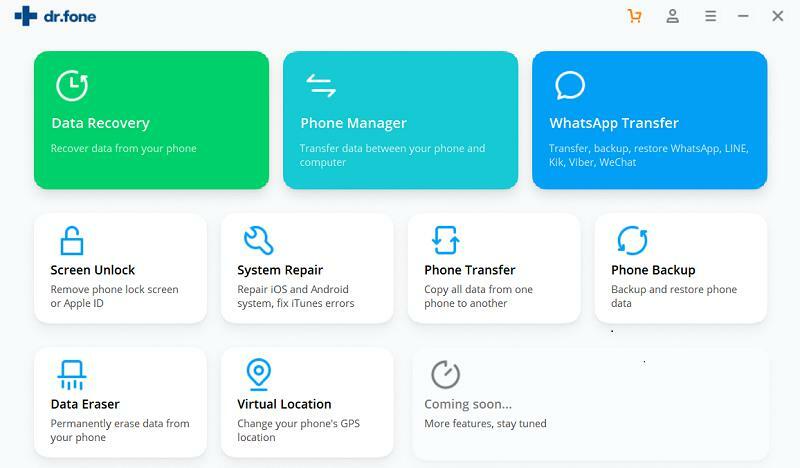 If you are facing iPhone storage full but nothing on phone issue then it is highly advised to follow the process which has been mentioned as under to get the work done with ease. Step 1: Once you have downloaded and launched the program it is advised to connect the iDevice with the system so that the program detects it on its own. Click 'Data Backup and Restore' on the main interface. Step 2: To proceed with resolving the iPhone Storage problems, on the next interface you need to take a look at the files types which the program detects on your device. You need to choose the file types which to be back up. Select “To view the previous backup file” only if the media has been backup using the same program before. Then wait for the program to backup the files. Step 3: The program will let you preview the files which have been restored. To resolve iPhone storage problems select the files to either restore these to device or export to Mac to complete the process in full. It is one of the easiest ways to make sure that the iPhone Storage Problems are resolved. 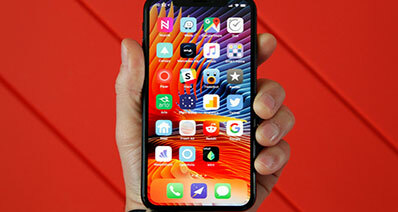 It is a one-step process which can be followed to completely clear the iPhone storage or at least large quantities of it. Just to make sure that the process goes well you just need to tap and hold the app. It will start wiggling and a cross will appear in the top right corner. Tap the cross and it will make sure that the app is deleted. It will also resolve the iPhone Storage Problems completely. The unused apps are the greatest issue which a user encounters and must be completely resolved. 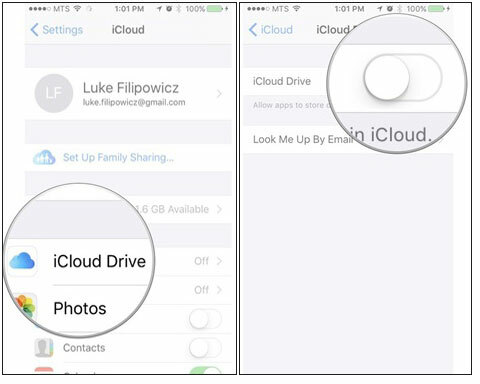 To make sure that the iCloud drive is turned off there are several processes which can be followed. Among these processes, the one which has been mentioned below should be followed to get the work done. Click on the settings of the iPhone to start the process. Tap on the iCloud icon soon as you find it within the settings. 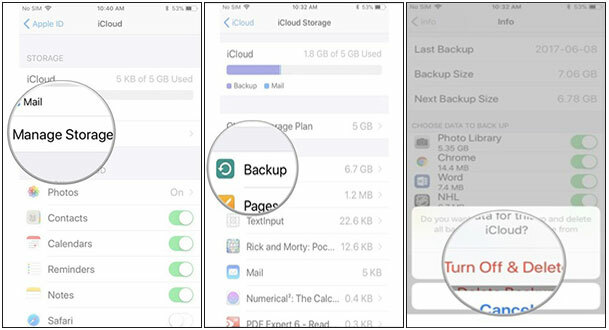 Tap on the iCloud drive to resolve the iPhone Storage problems. Turn off the iCloud drive to completely resolve the issue. The steps which you need to follow are mentioned as under. Click the settings app on your iPhone and then the Apple ID of yours. 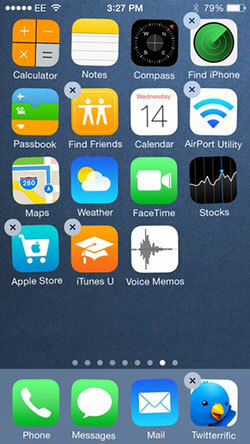 Make sure that you click the iCloud tab on the next screen to resolve iPhone storage problems. Click on the manage storage tab which can easily be located on the next screen which appears. Tap the Backup tab on the next screen. Click the device name you want to completely delete the backup files from. Tap the delete backup files on the next tab. 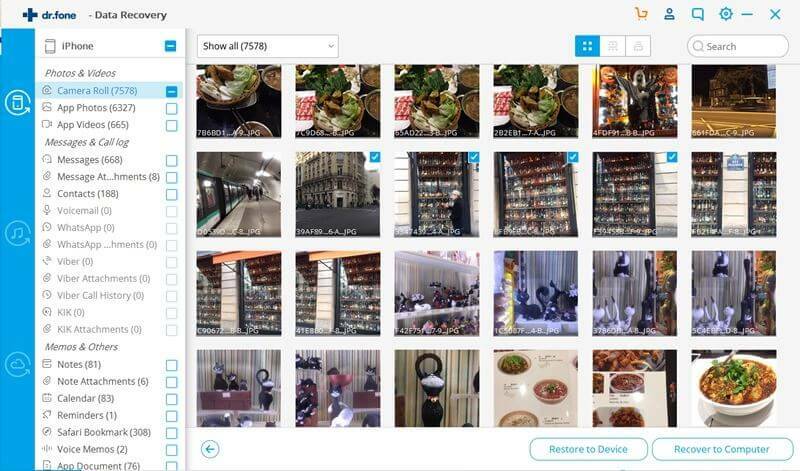 On the next screen confirm that you want to delete the backup files and resolve iPhone storage full problem in full. To some users or readers, it might sound weird but the fact of the matter is that the Apple has introduced the file management system from iOS 10.3 release. It ensures that the file space is saved on your iPhone. To make sure that the best outcome is generated in this regard and iPhone, not enough storage issue is resolved. Updating iPhone is a very easy process to follow and the steps involved are self-explanatory. To make sure that you get the best out of the process the steps which are explained as under should be followed to get the work done easily. Just click the General > Software update. Just accept the update and it will be installed on its own. It will completely resolve iPhone, not enough storage issue in full. The process has been explained as under. Click on a General tab within the settings. Click on Software update. Download and install the update to move closer to resolving the iPhone Storage full issue completely. Enter the passcode if required. This is another issue which can lead to low storage levels on iPhone and can cause the iPhone storage full. Sorting the text messages can cause the issues so to resolve these it is advised to stop sorting these to get the work done. It will completely resolve the problem in full. The process which is related to the subjected issue is very simple to follow. Just tap the settings app and then messages. Find the message history from by scrolling to the bottom and then tap the keep messages. Change the forever to 30 days or 1 year. 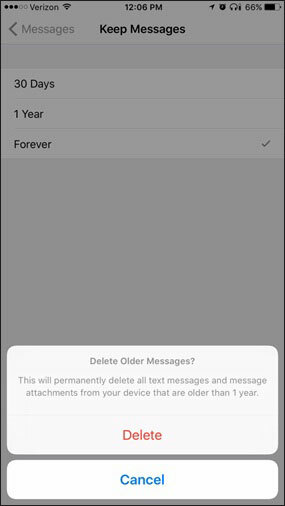 The prompt will ask you to delete the messages which are older in nature. Click delete to completely resolve the iPhone storage full problem completely.